Photograph showing Hannah Margaret Smith (b. 26 Apr 1872, d. 6 July 1943) and Robert Fletcher Clemence (d. 1951)at W.E. O'Brien's photo studio. They were married on 16 November 1904 and I would guess that the photograph was taken on or about that date in commemoration of that event. 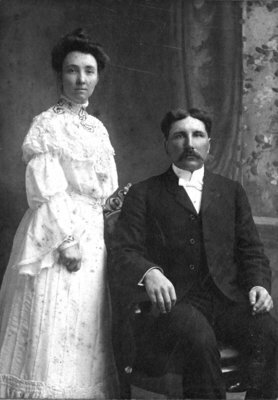 This couple was married November 16, 1904. While the exact date of this image cannot be determined, it is safe to assume the photograph was taken on our about that date in commemoration of the event. Copy made with permission from owner of original. Scanned from original photograph.